Quotes Illustrated is an artbook with artworks inspired by quotes. 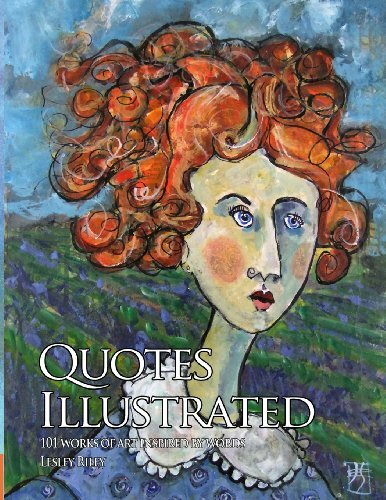 Author Lesley Riley herself collects quotes she likes and she has set out to produce this book with contributed artworks. While the art may be inspired by the quotes, sometimes it's difficult to see if the art has got anything to do with the quote. For those artworks without the quotes written onto them, you can just swap with any artworks without noticing anything amiss. The quality of artwork varies, there are a few good pieces as well as not so good ones. Most are sort of like collage or scrapbook style, mixed media. The quotes by the way are not quotes from artists or quotes about art (there are some though about creativity). And they are also not the inspirational type of quotes. They are, well, just quotes, by mostly by unknown people who could be writers since they somehow wrote the quote. It would be good if they had mingled more quotes from more prominent people. This book is now out of stock. It seems like publisher North Light is going to reprint the book. I had no idea what's inside when I ordered the book. Amazon's Look Inside feature does not show any content after the author's introduction. Anyway, this book was not what I had expected so I don't feel my money was particularly well spent.